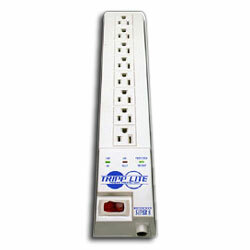 8 AC Outlet 15 Amp Surge, Spike, and Line Noise Suppressor from Tripp Lite has 8 outlets. The unit has 1,200 joules of surge energy absorption to handle the strongest surges. Diagnostic LEDs alert the user to potential power problems. The SK6-6 comes with child safety covers and color-coded cord identifiers.